While preparing for Maker Faire 2015 we built a new table for Noisebridge, called NoiseSquare. Here is how it works. Most of the Table is 3/4" Red Oak finish plywood. Nearly all the external joinery is done with #20 biscuits and Titebond 3 wood glue. The internal structure is 3/4" CDX plywood with Kreg pocket screws and wood glue. The stain is "American Walnut" from Minwax applied with t-shirt scraps and everything but the table top is Varathane Interior polyurethane applied with a foam brush in 3 coats. 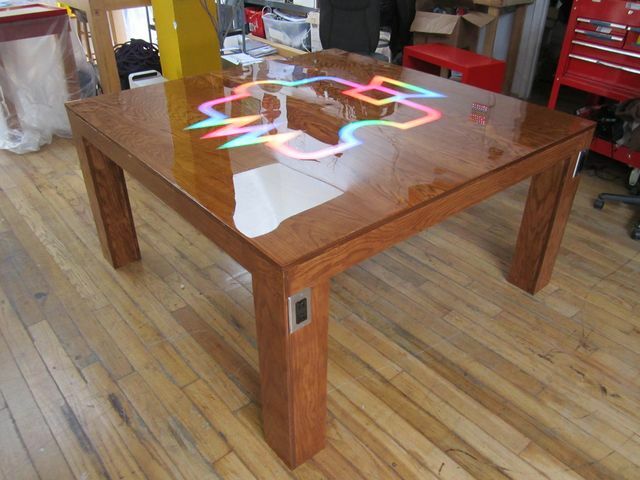 The table top surface is finished with a flood coat of Ultra-Glo epoxy resin from Tap plastics. Below the table top is another layer of plywood which holds the LEDs. The Noisebridge logo was hand routed into both of these layers with a top bearing router bit. The bottom panel is screwed on with pocket screws and it is easiest to remove and reinstall them if the table is upside down. The ESP8266 is accessible across the network at square.noise This is no longer controlled by and Arduino Mega r3. See the software section below. AC power enters through a 10amp fused power inlet at the base of one of the legs. 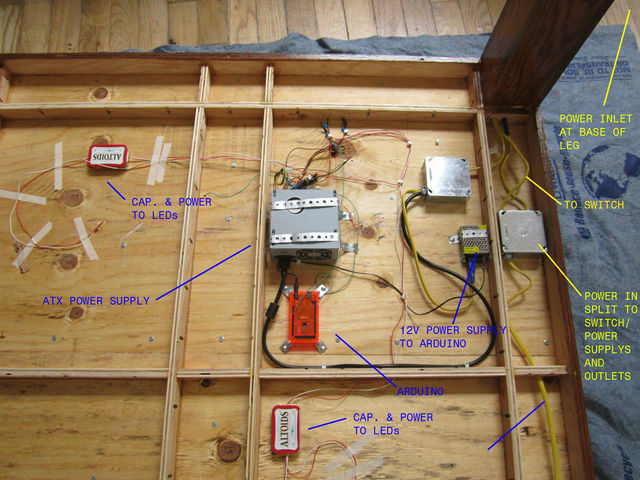 The power is distributed to the outlets and then to a switch which controls the power to the power supplies. There are 291 LEDs in the tabletop. LED #0 starts the chain underneath the speaker at the bottom of the speaker. The Noisebridge Logo in the table top surface is filled with 3/4" of EasyCast epoxy resin with a pearlesent pigment added during the mixing. This was poured in four batches. During the pour, the table top and internal logo pieces were placed on top of a mylar sheet that had been coated with spray adhesive. This was placed on a pre drilled wood surface and screws were driven up into the table top through the Mylar to hold the parts in place during the resin cure. Once the resin for the logo had fully cured ~72 hours. A top coat of Ultra-Glo resin was poured over the entire table top to create one smooth layer. The LEDs are controlled by an ESP8266 running some codeby Scotty. You can send things for it to display over the network. The ESP8266 supports the Flaschen Taschen protocol on port 1337. If you don't send anything for 10 seconds, it will go back to displaying its default animation, which is baked into the ESP8266 server code. You can download client libraries from Github. 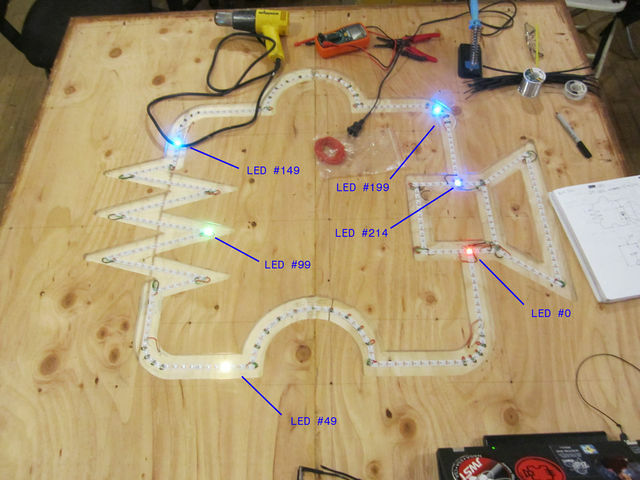 LED Strips are WS2812B with GRB color sequencing. Pin 1 is used for the striplight data connection. Get estimates for the amount$ paid for all necessary supplies listed above. Provide locations for purchasing and/or otherwise obtaining these necessary supplies. This page was last modified on 12 December 2016, at 01:47.